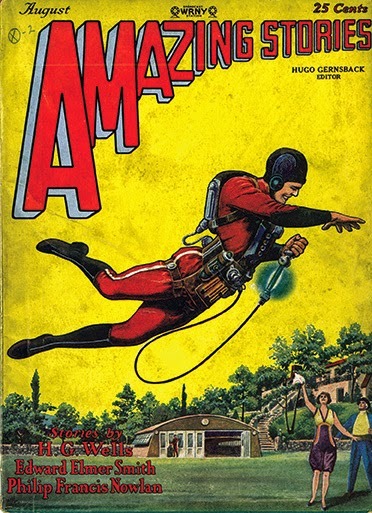 Frank Paul, "Flying Man," on the cover of Amazing Stories 3, no. 5 (August 1928). A hundred years have passed since the world’s first scheduled passenger airline service. In Florida, on January 1, 1914, a Benoist XIV airboat flew from St. Petersburg to Tampa with one paid passenger. The distance was a mere 23 miles across the bay, but it was an epoch-making event, ushering in the age of commercial flight. Today, air travel has become so mundane a part of our lives that it is difficult to imagine just how extraordinary this experience was in the early twentieth century. As much as human flight was about conquering gravity and going to distant places without the travails of earthbound journeys, it was also about seeing the world anew from a privileged position in the sky. To many early passengers, viewing the geographic composition of the Earth from an airplane was like being god. This peculiar hubris in many ways foreshadowed the omnipotence with which today’s drone warfare is carried out with surgical precision, or how a satellite’s panoptic surveillance of the Earth is used to create a vast body of data on an unwitting people. As aviation matured, a hyped cultural consciousness came into focus in America after World War I. The rapid proliferation of aerial photography of cities and landscapes during the 1920s often fused the airplane view with a Promethean seer to whom the Earth promised full disclosure. The mobile “eye” of the airplane seemed to distinguish the twentieth century from earlier times by virtue of its promise to transform fragmentary earthbound experiences into the “mingling lines of Picasso,” as noted art collector Gertrude Stein recalled her first flight over America in the 1930s. The captivating image of an airplane flying over the rising metropolis led many Americans to believe that a new civilization had dawned. Part popular fascination and part corporate promotion, the airplane was viewed as the harbinger of the “world of tomorrow,” and the aviator was its heroic builder. It was a time of spectacular faith in a shapeable future, when technology, as the American literary critic Leo Marx suggested, seemed to have replaced political will to bring about utopia. In all of these exuberant visions of the future, aviation presented a peculiar American twist. A new, purported vertical frontier counterbalanced the mythology of the western frontier’s horizontality. It was not surprising that when the twenty-five-year-old former Minnesota farm boy Charles Lindbergh crossed the Atlantic solo in his monoplane on May 21, 1927, many observers assumed that his heroic flight had rekindled the American mythos of the pioneer. “Lucky Lindy” was, as one author suggested in the wake of the sensational flight, “a Daniel Boone or Davy Crockett of the air,” a twentieth-century reincarnation of the frontiersman of the Wild West. 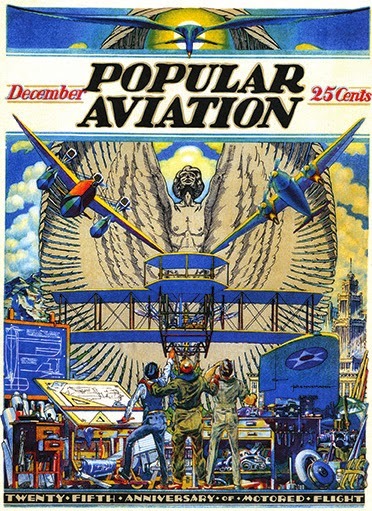 The cover of the twenty-fifth anniversary edition of Popular Aviation 3, no. 6 (December 1928). As the American historian John Ward argued, the America of the 1920s—ambivalent about its national destiny—needed an occasion like Lindbergh’s to deliberate on what it meant to be an American. (This was, of course, before the aviator’s fall from grace due to his reactionary politics.) Aviation and the aviator seemed like an alluring new chapter on American exceptionalism. In the 1930s, no other protagonist exemplified the populist anticipation of an ideal American character more poignantly than the pop superhero Superman, the human-shaped flying machine. Superman presented a masculine amalgamation of two Americas: The horizontal one was epitomized by the superhero’s Kansas upbringing, rooted in Jeffersonian pastoral sensibilities. The vertical one was exemplified by the rising urban theater called Metropolis, where he policed the boundaries of good and evil from the sky. If early aviation prompted a culture of technological utopianism, it also presented a paradox. On the one hand, many thought that the solo aviator symbolized the power of the everyman; on the other hand, only a privileged few actually could get on an airplane. The corporate executives of General Motors understood this paradoxical elitist stratification of society and sought its inchoate reversal as a shrewd marketing tool. Visitors to Futurama, the auto giant’s most popular show at that same 1939 World’s Fair, sat in a virtual cockpit to embark on a simulated flight over a future America of 1960. The idea was that if the fairgoers saw the world of tomorrow from the same lofty perspective of corporate bigwigs, then they would be seduced to feel that they were co-builders of the shining world they had just witnessed below. In the end, though, their momentary feeling of empowerment was an illusion that served as a robust corporate advertisement. Technology today seems to have embraced a new politics of mass mobilization. Yes, the cult of the likes of Gates, Jobs, Bezos, and Zuckerberg endures. But the global power of social media stems from the very participation of the masses for which these technologies were conceived. There is no Facebook without the people. There is no YouTube if people don’t upload their videos—some of which, indeed, can be life changing, resulting in fame or, at least, notoriety. The promise of individual empowerment by accessing the technologies of information dissemination has become a potent modern political driver. It seems that supermen of our times don’t have to be Superman at all. Yet, as technology continues to evolve, its potential to create a more dehumanized future cannot be ignored. Is the tech-savvy global citizen with universal online access merely a reinvented consumer of free-market economy in the digital age? Or, will technology become a self-perpetuating end in itself, while human agency diminishes? How does technology’s democratizing power intersect with the specter of governmental online surveillance? All of these remain open questions. 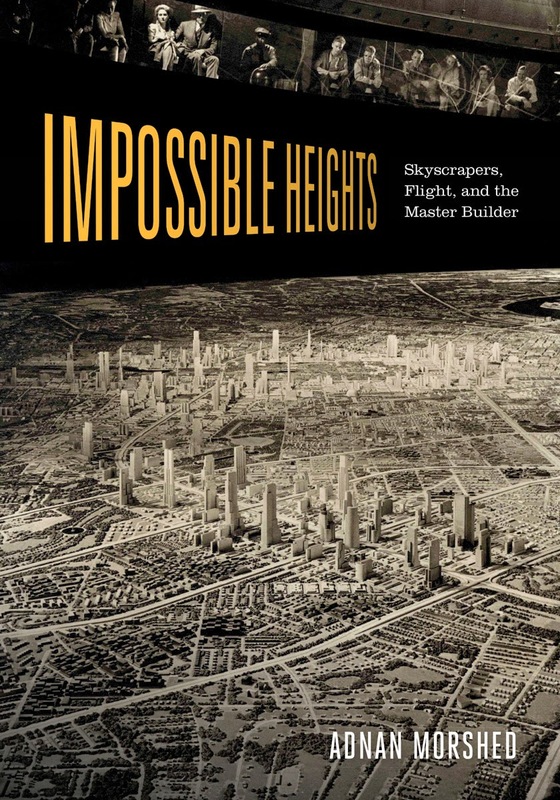 Adnan Morshed is associate professor of architecture and architectural history at the Catholic University of America, and is the author of Impossible Heights: Skyscrapers, Flight, and the Master Builder. 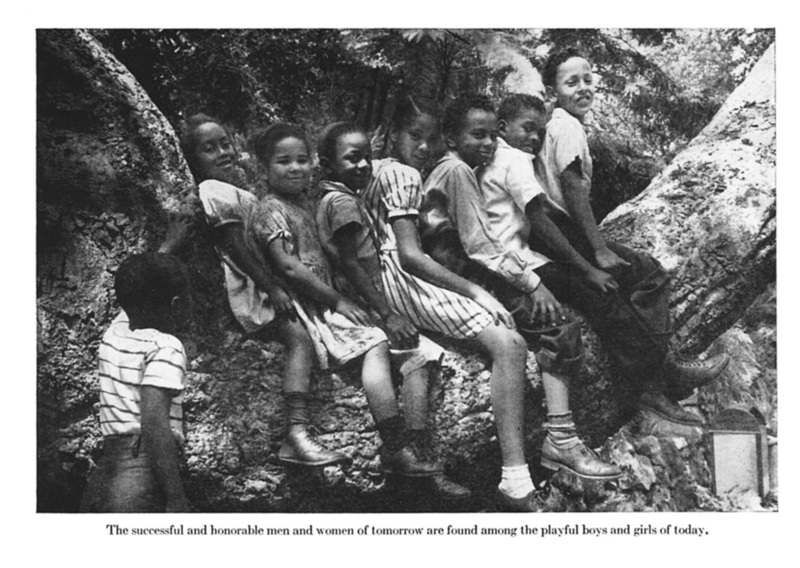 Children sit together on a tree limb in an uncredited Seventh-Day Adventist image. From Louis B. Reynolds and Charles L. Paddock, Little Journeys into Storyland: Stories That Will Live and Lift (Nashville: Southern Publishing Association, 1947). 2015 marks the 50th anniversary of the Voting Rights Act, legislation that responded to repressive practices in the South severely limiting black enfranchisement, such as literacy tests and poll taxes. When we think about the Civil Rights Movement, we tend to think through such landmark events, those marshalled by prominent leaders and located in the public record. Considering the events of fifty years ago, in the spring and summer of 1965, the marches in Selma spring to mind, especially given the 2014 film that dramatized “Bloody Sunday” on the Edmund Pettus Bridge. Young people were deeply invested in the movement, of course, and while we remember the losses of individuals like Emmett Till and the four little girls, other accounts of children’s participation in the movement often focus on numbers – hundreds of children jailed with King in Birmingham, scores of children marching in protests, groups of teenagers in Freedom Schools in Mississippi. When I think about how to access the stories of young people, individuals who worked with great forethought and commitment on behalf of social justice, I think about the public terrain of childhood, which for me is children’s books. Four teenagers in a college dorm looked at the photographs in a history book and decided to change the world. This was something different than witnessing photographs within a newspaper or periodical, though certainly the September 1955 Jet magazine coverage of Till’s lynching galvanized a generation of young activists. The fact was that McNeil and his friends engaged the historical continuity outlined in the book – that black communities had been resisting oppression for centuries – and then saw themselves as the next chapter in that story. The book form and the photographic document made change seem possible. In one potent image within Today, children make a tower of blocks in the foreground while women organize for a meeting at the edge of the page. As a community, children and adults were building a new sense of themselves and their future, claiming the power of representation in word and image. Children play with blocks while adults gather in the background. From Today, Child Development Group of Mississippi, 1965. McCain Library and Archives, The University of Southern Mississippi. Legibility and cultural memory are contests of power. As we recall the landmark events of 1965—the victories of the Voting Rights Act and the Immigration Act, as well as the losses of Malcolm X and the riots in Watts—we can also seek out stories of Civil Rights mobilization that are, perhaps, more local and intimate. We can also consider the idea that books can be social, that a reading experience can draw children into conversation with adults and into conversation with the ideas the books explore. 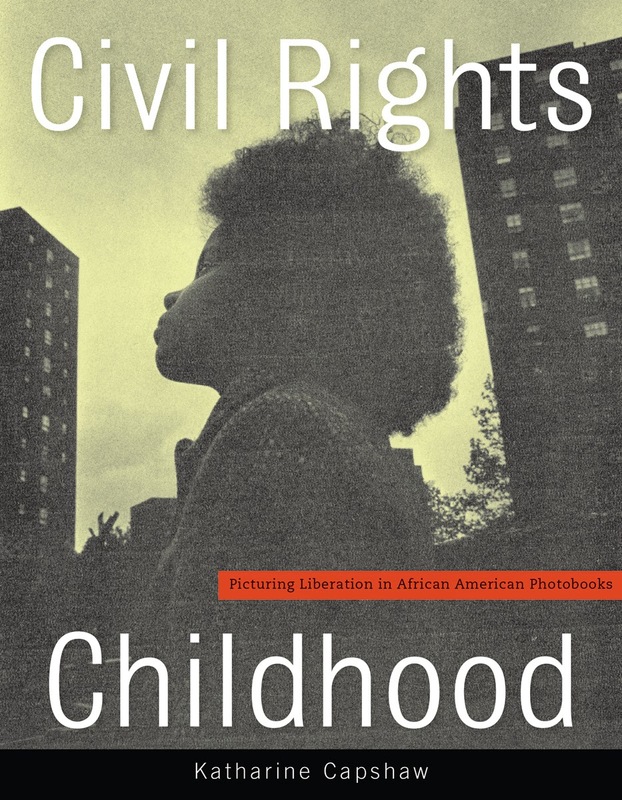 For civil rights photobooks, a form that seeks to inspire a child’s participatory response, images can spur reflection on the possibility and value of a young person’s life. 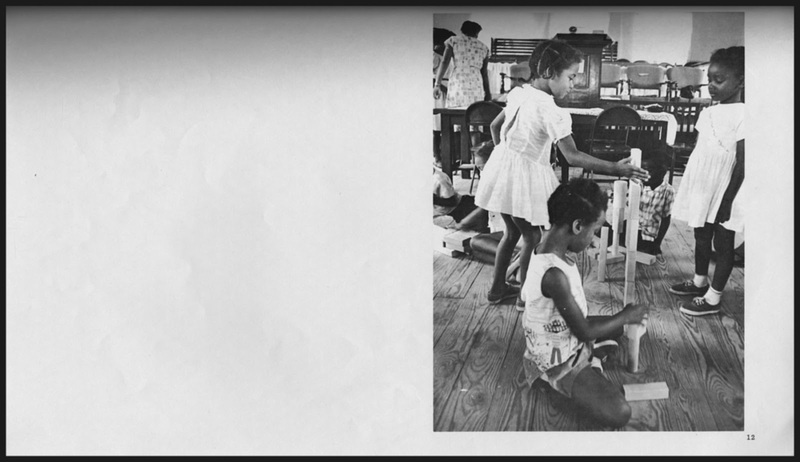 Katharine Capshaw is associate professor of English at the University of Connecticut, Storrs and the author of Civil Rights Childhood: Picturing Liberation in African American Photobooks.